Enjoy the mysteries of the sea from the safety of your own terminal! You can subscribe for updates at the Freshmeat page. If you're running Mac OS X, Chuck Houpt has put together a packaged version that will run out of the box. For KDE users, Michael Pyne and Maksim Orlovich have written a KDE Screensaver based on the Asciiquarium. Claudio Matsuoka has created a live wallpaper for Android! 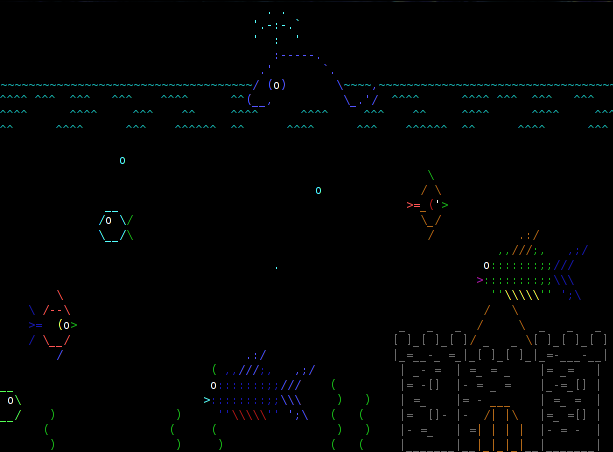 J. Sommer wrote a screensaver, so you can finally run the ASCIIQuarium on Windows!